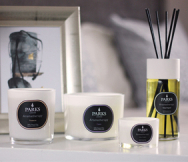 Introducing the Parks Wild Fig & Cassis Diffuser, a luxury home fragrance product with the power to fill your space with irresistible fruit and floral scent. Capturing the warm and spicy notes of orange blossom and cassis with a rich, velvety base note of sun-ripened figs and succulent blackcurrants, this natural rattan reed diffuser is the perfect addition to any living space. When it comes to popular home fragrances, wild fig is among the most sought-after. Capturing the scent of the succulent flesh of the sweet fig fruit, a distinct, green and fruity aroma that's effortlessly sophisticated and contemporary, so you can create a refined and elegant environment in your home. Seeking to balance the green base notes of fig, our skilled perfumers have introduced several complementary fragrances, including succulent blackcurrant and warm top notes of orange blossom and cassis. This lightly spiced citrus aroma adds complexity and depth to the fragrance, for a potent and lingering scent. The Wild Fig & Cassis Luxury Diffuser is part of our exclusive Fine Fragrance collection. This range of luxury fragrances has been carefully made using only the finest raw materials, so you can look forward to a powerful and long-lasting fine fragrance. Comprising 100ml of beautifully scented diffuser oil and a handful of rattan sticks, this wonderful luxury diffuser will infuse your living space with a fine blend of beautiful perfumery ingredients by providing up to eight weeks of strong and invigorating fragrance. The diffuser is supplied in a luxury presentation gift box, making it the ideal gift for a special occasion.